Developed in conjunction with Wayne Township School System. An inequality is a mathematical statement that tells about two expressions that are not equal. 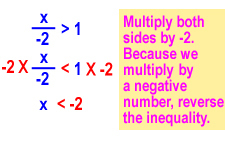 Inequalities may show an expression that is greater than or less than something. When we read an inequality, we read it from left to right. Ten is greater than 7.
x is less than 9.
p is less than or equal to 5.
y is greater than or equal to 4. Often, it is easiest to put the variable, such as x, on the left side of the equation. An inequality can be rewritten in the other direction; just make sure you flip the inequality sign. An easy way to remember this is to make sure the small end of the symbol is pointing at the same number. In this case, the small end of the < symbol is pointing at the x in both cases. To translate words into an inequality, first decide what symbol to use. Are the things being described greater than, less than, greater than or equal to, or less than or equal to something? Then figure out which expression is larger and put that on the bigger (open) end of the symbol. Put the other expression on the other side. Remember that an unknown can be represented with an x or another letter variable. How about “Buying 10 gallons of gas will cost more than $30” as an inequality? Let’s practice some of these now. 1. Which symbol means less than? 2. Which symbol means greater than or equal to? 3. Which symbol means less than or equal to? 4. Which symbol means greater than? 5. How would you write “three is greater than zero”? 6. How would you write “x is less than or equal to 9”? 7. How would you write “m plus four is less than 6”? Graphing simple inequalities is easy. A simple inequality has the variable (x or some other letter) on the left and a number on the right. To begin, put a dot on the number line for the number given. If the inequality symbol is or , use a regular solid dot. If the inequality symbol is < or >, use an empty dot. For or , use . For < or >, use . First, put a dot on the number line at the point of the number on the right of the inequality. Then draw a line with an arrow all the way to the right if the symbol is > or . Draw a line with an arrow all the way to the left if the symbol is < or . You can remember these by just thinking about what the symbols mean. means greater than the number (but not equal to, which is why the dot is empty, because the number itself is not part of the answer). means less than the number (but not equal to, which is why the dot is empty). means greater than or equal to the number (which is why the dot is solid). means less than or equal to the number (which is why the dot is solid). Let’s look a few examples based on these rules. Choose the correct graph for each inequality. 17. What is the correct inequality for this graph? 18. What is the correct inequality for this graph? 19. What is the correct inequality for this graph? In an inequality, the variable (x or some other letter) is the unknown. To solve an inequality, we need to find the value of the variable. To do this, we get the variable on one side of the inequality by itself. We must keep the equation in balance, so whatever we do on one side of the equation, we must do to the other side as well. To get x by itself, we use inverse operations to get rid of whatever is with x. This means we do the opposite. If something is added to x in the equation, we need to subtract it to get rid of it. If something is subtracted from x, we need to add it to get rid of it. Remember that whatever we do to one side, we do to the other side as well. Here’s an example. Solve x + 5 > 9. We can see that 10 is greater 9, and our check works out. Let’s do another one. Solve m – 3 0. Remember that you need to use inverse operations to get the variable by itself. Let’s check our solution by plugging in a number that is greater than or equal to 3. We’ll use 3. Let’s do one more example. Solve p + 6 < 8. We can check our solution by substituting a value that is less than 2. We’ll use 1. 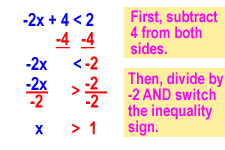 Let’s take a look at inequalities that involve multiplication and division. Again, we need to get the variable on one side of the inequality by itself. To keep the equation in balance, whatever we do on one side of the equation, we must do to the other side as well. To get x by itself, we use inverse operations to get rid of whatever is with x. This means we do the opposite. If something is multiplied by x in the equation, we need to divide by it to get rid of it. If x is divided by something, we need to multiply by it to get rid of it. 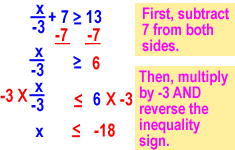 The only new step is that if we multiply or divide by a negative number, we need to flip the inequality sign. Let’s do an example. Solve 6x > 12. Let’s check our work. We need to substitute in a number for x that is greater than 2. We’ll use 3. 18 is greater than 12, so our check is good. Since this problem doesn’t involve multiplying or dividing by a negative number, we don’t need to flip the inequality sign. Let’s do another one. 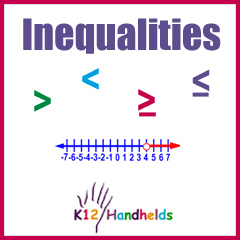 This one has a negative number, so we’ll need to remember to flip the inequality sign. Solve –2t 10. Let’s check our work. We need to substitute in a number for t that is greater than or equal to -5. Let’s use -4. Let’s do another one that has division in it. For this problem, we’ll need to multiply by –2 to get x by itself, so we’ll need to reverse the inequality sign. Let’s check our work. 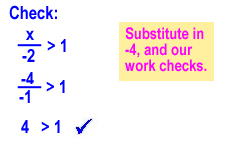 We need to substitute in a number for x that is less than -2. Let’s use -4. Now, let’s put together everything we’ve learned. When you have both multiplication or division and addition or subtraction, undo the addition or subtraction first. Here we check our work by substituting in a number for x that is less than 7. We’ll use 6. 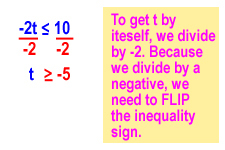 Remember that whenever we divide or multiply by a negative number, we need to flip the inequality sign. Here we check our work by substituting in a number for x that is less than -18. We’ll use -21. Here we check our work by substituting in a number larger than 1 for x. We’ll use 2.